Copyright © 2007 by Danny Ross Lunsford and Eric M. Jones. Last revised 17 August 2009. Enhanced versions of two of a series of nine photos of Earth - AS14-64-9189 to 9197 - that Al Shepard took of Earth over the LM at 135:03:42 while waiting for CapCom Fred Haise to get an answer from the Backroom. Scans of the images taken on the moon sometimes show star-like spots due to dust on the film or other causes. Usually, spots don't appear in separate frames of the same celestial location (see below). The fact that this star-like object shows up in both frames at the same location relative to the crescent Earth strongly indicates that it is a real celestial object. The fact that it also appears in the same relative location in the other seven frames in the series is compelling evidence that it is either a planet or a very bright star. Note that Charlie Duke also photographed Venus, capturing it in three frames of his Apollo 16 Station 10 Prime panorama. Software such as Starry Night or Celestia let us see what the sky was like at the Fra Mauro landing site at the time Shepard took the photos, which was about 1207 GMT/UTC on 6 February 1971. A quick look shows that Venus was in the right relative location. At that time and on the airless Moon, Venus had an apparent magntiude of about -4.1. Only the Sun and Earth were brighter. The next brightest object visible at that time was Jupiter, with a magnitude of -2.0 but eight degrees west of the zenith and well out of the field-of-view. 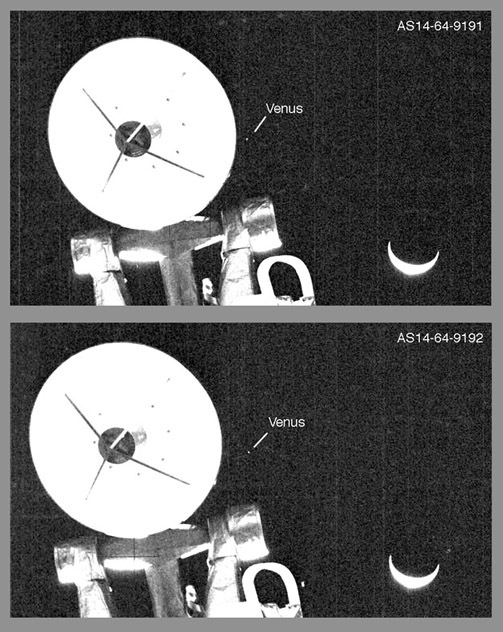 Even if it had been in view, it would have been 7 times fainter than Venus and, because of the short exposure times, might not have registered on the film. This comparison has a negative (reverse) detail from AS14-64-9191 on the right and a negative detail of Venus and the Earth from Starry Night. The latter has been rotated and scaled to match the mission photo. An overlay of the two images is shown at the center. Note that we are able to match both the separation between Venus and the Earth and the Earth's size, which further confirms that the star-like object is Venus. Even though Venus's angular diameter as seen from the Moon was only 21 arc seconds - about 1/325th of Earth's - it has the same surface brightness it would have if we were right on top of it, because of the inverse square law of light propagation. Because Venus is covered with clouds, and closer to the Sun, its surface brightness is roughly twice that of Earth. Consequently, an exposure that gets the Earth right, will also necessarily show Venus. This is why you can see Venus in broad daylight if you know exactly where to look - and can manage the trick of focusing at infinity when confronted with an otherwise featureless scene. As mentioned above, Venus is present in all nine of the images in Al Shepard's sequence of Earth photos. In many of the images, we can also see bright spots which, because they don't repeat from frame to frame, are undoubtedly due to dust on the film or on the scanner, or some other cause unrelated to what was actually in the sky over Fra Mauro. In the following film strip, the details from the mission photos are presented at the same scale and with the same brightness enhancement (255 levels reduced to 50). For ease of comparison, an L-shaped figure was drawn from the detail of AS14-64-9192 with the longer line connecting the horns of the crescent Earth and the shorter line pointing at Venus. The L-shaped figure was then superimposed on each of the other frame details after a rotation needed to put the figure into same orientation relative to the crescent and to Venus. No scaling was done. Rotation of the L-shaped figure is necessary because Shepard took the photos while holding onto the LM ladder, leaning back, and holding the camera in his hand. As can be seen in the film strip, he was in much the same position while taking each of the first five photos but then leaned to his right - moving Venus away from the rendezvous radar antenna - for the last four photos. Possibly he saw Venus and shifted to his right to ensure that he captured it in at least the last four images. We don't know if he changed f-stops, but all the frames were undoubtedly taken at 1/250th of a second. after a similar animation posted at ApolloHoax.net by 'Data Cable'. Details from the nine frames taken by Al Shepard at about 1207 GMT/UT on 6 February 1971. The L-shaped figure was constructed as an overlay to 9192 with the long line connecting the horns of the crescent Earth and the short line pointing at Venus. The L-shaped figure was then superimposed on the details from the other frames after a rotation to reproduce the positon of the figure relative to the crescent Earth and Venus. No scaling was done. Note the various star-like spots, particularly in the later frames.